Cleaning grease off of kitchen cabinets can be a tough time consuming job if not done on a regular basis. 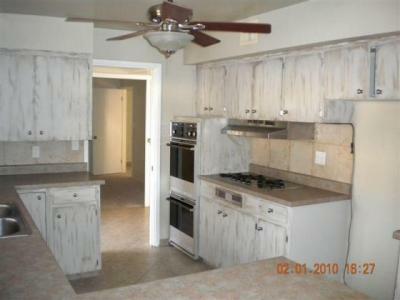 But you can remove old hardened grease from your cabinets without damaging the surface. Here are some ideas. First of all to remove fresh grease from cabinet doors, take a sponge or cloth and some grease cutting dish soap and wash off. Rinse with clear water and dry with a cloth. For thicker grease, mix 3 Tblsp of baking soda with 1 cup warm water. Spread over greasy area and gently agitate. Rinse and wipe dry. 3 ways to remove older grease build up is to apply white vinegar, spray with Fantastik or 409. Wipe with a paper towel and then rinse and dry. Also try rubbing Murphy's oil soap onto hardened , stubborn grease. Rub with a sponge or cloth. Dry with an absorbant cloth or paper towel. If you've had long-standing, hardened grease that won't respond to the methods above, use a solvent like mineral spirits, lemon oil, or turpentine. Gently dab onto the grese but don't allow it to be put directly onto the wood or it could remove the finish. After this step, use murphy's oils soap to finish the cleaning.